You recall the day it was taken: the smell of the air, the background sounds, food and drink, laughter, and the sense that this was forever. You’ve seen that photo many times throughout the years, but it never fails to remind you of the best of times. Or, as in the new book Tin Man, by Sarah Winman, it may represent the worst. He did—and one day, Michael walked back in, as if nothing had happened and things seemed to pick up where they’d left off. Ellis was content again with his day-to-day until the car accident, and his entire world died. It took awhile to heal—as if that would ever fully happen—but his losses made distant memories keener and Ellis began thinking about a painting that his mother and Michael had particularly loved. Having it would mean a lot so, knowing that it was stored in his father’s attic, Ellis fetched it. That’s when he found a boxful of Michael’s things, including a notebook…. 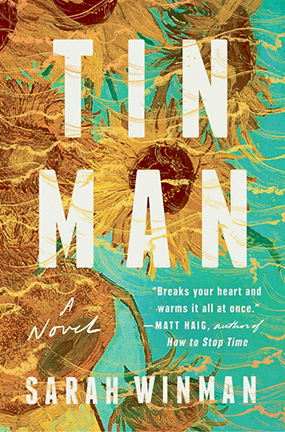 There are a thousand emotions that you’ll feel when you read Tin Man, starting with a melancholy sense of foreboding. Don’t beat yourself up for it, though. Every character here has reason to feel that life is no good. That alone might make you not want to read this book—why try something when you know it’s going to depress you, right? Wrong: author Sarah Winman also repeatedly offers a most persistent flame of hope in her story, from Ellis’ mother, who finds beauty in a booby-prize painting; to Annie, who happily understands Michael’s needs; and Ellis himself, who learns again what he already knew.